Whether you love cleaning or hate it, finding some time-saving cleaning hacks and tricks will definitely shave some time off of your tasks. 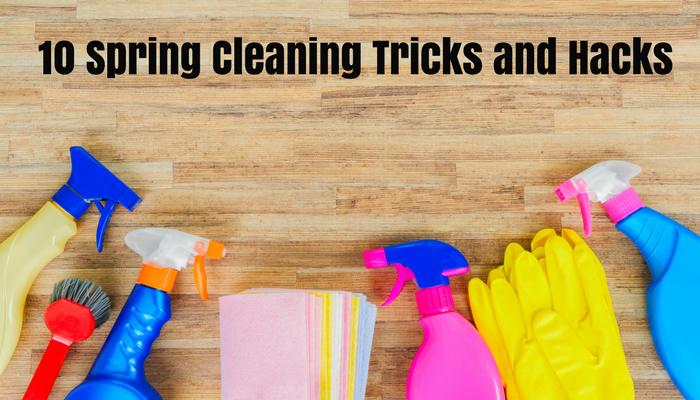 We are starting to head towards spring and if you're thinking about organizing here are 10 secrets, tricks, and hacks to make your spring cleaning so much easier. #1. Use vinegar for just about everything. Hard water stains can be a nightmare to get rid of but a little bit of white vinegar make them disappear. You don't even have to scrub that hard. Plus, vinegar is a safe, natural way to clean your home without a lot of harsh odors or chemicals. Vinegar also works great for cleaning your microwave. Pour little vinegar into a bowl and set it on high for four minutes. Eat away at all the nasty gunk that is on the inside of your microwave so that I can be easily wiped away. #2. Use of fabric softener sheets. These things are magic. You can use them to remove water spots from mirrors and fixtures, clean up that ring in the toilet, wipe down baseboards, and attic dust fighting layer to everything as you go. #3. Clean your shower when you shower. Glass showers, white tubs, and moldy shower curtains can be a thing of the past if you clean them while you are taking a shower. Take in a scrub brush and while you're in there, do double duty. #4. Use Kool-Aid to clean your toilet. It's actually full of non-toxic citric acid the easily clean your toilet. Pour in a packet of Kool-Aid and let it sit overnight. Flush again in the morning and that's it. #5. Set up cleaning buckets in each bathroom. A simple bucket, rubber gloves, sponge, and spray in each bathroom will help eliminate the need to haul these items from one place to another all over the house. #6. Use your dishwasher to clean household items. The dishwasher isn't just for dishes. You can clean sponges in plastic toys, pet dishes and even hairbrushes. Let your appliances do the hard work. If you have pets, a liberal is usually the best tool but if you don't have one handy, put on dishwashing gloves and rabbit rapidly on the upholstery. The electrical charge it builds up will allow the hair to stick to it and then just toss the glove. #8. Use vodka for stubborn tub stains. Use vodka to spray stubborn bath tub stains. Let it sit for 10 minutes and then cleaned normally. #9. Seal up any nonseasonal items in a vacuum sealed bag. Put them away and not only are they space-saving, but you won't have to worry about clogging up your closet with items you won't wear. #10. Use cream of tartar and lemon juice to clean stainless steel. A little combination of these two powerhouses will make any of your stainless steel in your house just sparkle. Use it on grills, kitchen appliances, and any other stainless steel surfaces.